Cruisers who embark their ship at the Port of Charleston will discover a cruise terminal that's conveniently downtown with on-site parking. The airport is just a half-hour cab ride away as well. And just outside the terminal is a city with a storied past. History lurks around every corner in Charleston. Fortunately, myriad restaurants, a historic market and a walkable downtown are just blocks from the cruise terminal. Freelance writer and copy editor Lizz Dinnigan looks at the Port of Charleston, its facilities, services and parking. Charleston's downtown historic district is just a few blocks walk from the cruise pier. Many cruisers opt to not book an organized shore trip, but simply to wander this fascinating port of call on their own. If you're out and about in downtown Charleston, SC, you'll find great historic walking tour options, carriage rides and buildings to tour. But when it's time for lunch or dinner, where should you go? 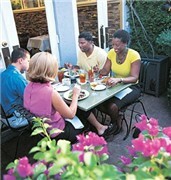 Charleston is rich in restaurants for every taste. One of our Charleston area freelance writers Natasha Lawrence shares her list of favorites here. Charleston, SC. Encircling the city are multiple historic plantations that -- in style and aura at least -- seem to slip back into the past. Drayton Hall delivers architecture from the 18th Century Federal Period. 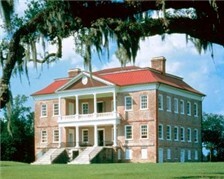 In contrast, the Boone Hall Plantation with its dramatic oak-lined entry road was featured prominently in the 1980s mini-series "North and South". Gardens and eco-areas draw visitors to Magnolia Plantation & Gardens. And Middleton Place was to a great extent destroyed in the War Between the States but its magnificent landscaped grounds and English gardens remain. Sheep often graze on the front yard. For a peek into Charleston's plantation past and what you might see at each mansion if you choose to book this type of a trip for a shore excursion, check our piece by freelance writer Natasha Lawrence.